With audio capture feature,which can capture video and audio information. Provides OSD with 8 languages. Horizontal mirror,WDR,HLC,ATR,Smart IR,Motion detection,2D-NR and 4 zones Privacy mask functions,etc. 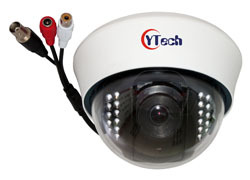 Match with 700TVL IR sense CCD.The minimum illumination is 0Lux with IR on. The Enhanced "Effio-E" (CXD4140GG) includes OSD (on-screen display) functions that allow camera settings to be made using the display.This function provides preset menus in eight languages (English,French,German,Spanish,Portuguese,Chinese,Russian,and Japanese) and allows camera settings to be made easily without using an external microcontroller. Confirmed maximum resolution to achieve the 700TVL. Measurement method is referred to JEITA (TTR-4602B). The ATR (Adaptive Tone Reproduction) function provides gradation compensation to improve the contrast of subjects whose gradation has been lost in cases where,for instance,both low-luminance areas and high-luminance areas exist in the same picture. The ATR function improves the visibility of the entire picture by providing the optimum gradation compensation for the image in one field based on the luminance information. Noise reduction is a function that reduces the image noise in order to improve the image quality of the camera.In particular,it reduces the noise which is generated under low-brightness shooting conditions and other high-gain states. The Enhanced "Effio-E" (CXD4140GG) comes with a space-based NR (2D-NR) function. This camera is equipped with infrared lights.It will automatically open infrared light to compensate ambient light in low-light environment.It applies to poor-light or any dark environment,displaying clear images in the dark. WaterProof: Without waterproof function,work for indoor.